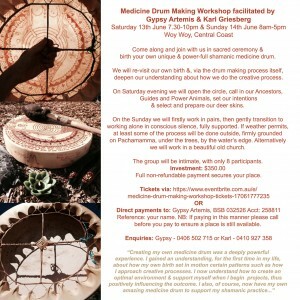 I am pleased to announce our up-coming medicine drum making workshop running in Woy Woy, on the Central Coast of NSW. The medicine drum is also known as the “shamanic drum”. The workshop will be facilitated and supported by me, Shamanic Midwife, and Karl Griesberg, Shamanic Practice student.